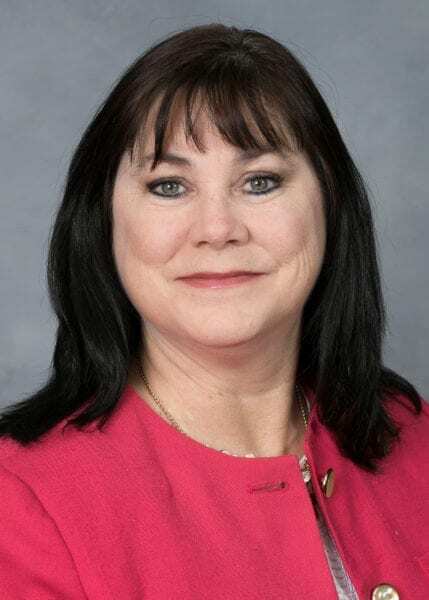 Rep. Beverly Boswell of Kill Devil Hills dropped mention of being a registered nurse on her campaign website and Facebook page this week at the instruction of the N.C. Board of Nurses. Following up on a tip from a private citizen, the N.C. Board of Nursing instructed Boswell on March 8 to make the changes. She has since corrected her title to medical assistant and phlebotomist, which has been included in a brief bio at at the end of press releases sent to the media since the campaign began this winter. Our records at the N.C. Board of Nursing did not list her as having ever been a nurse in North Carolina. I spoke with the Representative and she said she never held herself out as being a nurse. She said she would correct her on-line material immediately. Her election material was corrected the very next day. Today, I was informed her Facebook page had not been changed so I left a message at her office to please correct that page as well. “Rep. Boswell is not a licensed nurse nor has she ever been a licensed nurse,” board spokesman David Kalbacker said in an email, according to a report by The News and Observer. Her campaign materials and webpage, and even those introducing her at events dating to the 2016 campaign had either repeated or made similar statements that, until Tuesday, were on her Facebook page bio. And at a recent event in Pamlico County, which is included in the Sixth House District starting this election, several in attendance said Rep. Michael Speciale, R-New Bern, used the same line during his introduction of Boswell. Boswell’s Facebook bio prior to its editing Tuesday. According to The News and Observer’s story Wednesday, the misidentification is an issue for the board because the nursing profession is regulated by the state government. Those hoping to become a registered nurse in North Carolina must attain an associate degree in the field — usually a two-year process — then pass a test to acquire a nursing license, the newspaper said. Phlebotomists, meanwhile, aren’t required to obtain a license in North Carolina and the practice is far less regulated. However, many employers require phlebotomists to obtain certification through a national professional organization. In an interview with The News & Observer Tuesday afternoon, Boswell said she was unaware of the mistake until contacted by the nursing board. She said the registered nurse job title was included online because a campaign volunteer misunderstood her job. 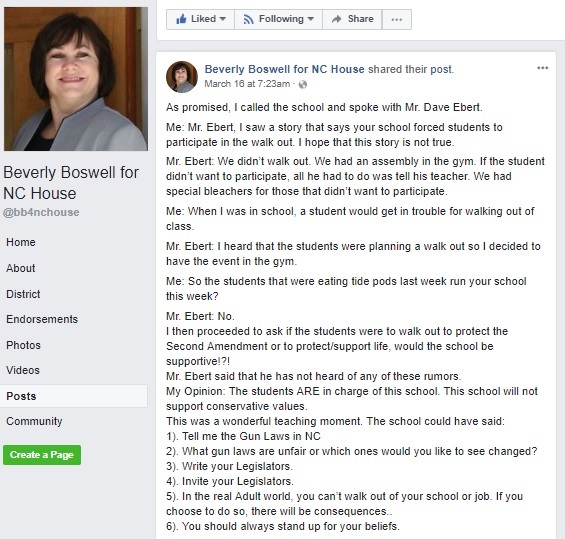 Last Thursday, Boswell shared a link from a blog on her official campaign Facebook page that claimed a student at Roxboro Commmunity School in Person County, a middle and high school with around 720 students north of Durham, was told they had to attend an assembly on Wednesday. The school’s managing executive director, Dave Ebert, said in an interview with the News and Observer published Monday the assembly was set up to avoid classroom disruptions after students across the country planned to walk out on the one-month anniversary of a shooting that left 17 dead at Majory Stoneman Douglas High School in Parkland, Fla.
Me: Mr. Ebert, I saw a story that says your school forced students to participate in the walk out. 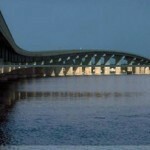 I hope that this story is not true. Mr. Ebert: We didn’t walk out. We had an assembly in the gym. If the student didn’t want to participate, all he had to do was tell his teacher. We had special bleachers for those that didn’t want to participate. Me: When I was in school, a student would get in trouble for walking out of class. Mr. Ebert: I heard that the students were planning a walk out so I decided to have the event in the gym. Me: So the students that were eating Tide Pods last week run your school this week? I then proceeded to ask if the students were to walk out to protect the Second Amendment or to protect/support life, would the school be supportive!?! Mr. Ebert said that he has not heard of any of these rumors. My Opinion: The students ARE in charge of this school. This school will not support conservative values. 2). What gun laws are unfair or which ones would you like to see changed? 5). In the real Adult world, you can’t walk out of your school or job. If you choose to do so, there will be consequences..
6). You should always stand up for your beliefs. The Tide Pod reference comes from a social media phenomena earlier this year of young people eating, or appearing to eat, the laundry detergent tablets that led to several deaths and injuries. Ebert confirmed Monday that the phone call took place, and noted students who did not want to participate were given the option to sit in the bleachers. He said the assembly lasted long enough for the names of those who died in Parkland to be read, and hold a moment of silence, and that it took longer for students to get in-and-out of the gym. 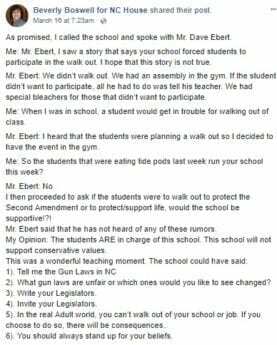 “There was nothing political about it,” Ebert told the N&O, adding he held the assembly in part because the school “didn’t want political statements” during a walkout, if students were to have one. Dare County and other school systems in and surrounding Boswell’s district held similar events to that of Roxboro Community School, which is 170 miles from her hometown, but nothing was posted about those events. Boswell’s Facebook page has several links to pictures and video supporting a counter-movement that took place on March 14, promoting “Walk Up Not Out” efforts. 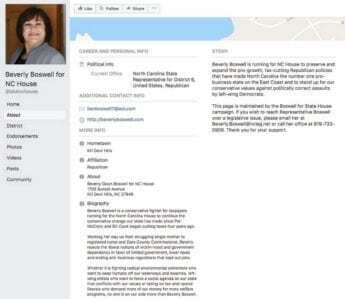 After The News and Observer story broke Tuesday, Boswell’s page posted a link to another blog that praised her for the comments, with her page emphasizing “…some of Boswell’s male colleagues could borrow some cojones from her” above the link that was shared. Boswell makes other politicians look good! Apparently WE are all wrong about Ms. Boswell and it is OUR fault for not understanding her actions or appreciating several things SHE has done for us that have not been adequately by the press. Seems like the only things missing in this scenario is Ms. Boswell calling out the Fake News and that many, many citizens and opponents are engaged in a Witch Hunt. We should all be ashamed for picking on this wonderful fantastic woman and not completely believing her and giving her more credit for all she has done to the Outer Banks. WE can do that in November!!! This fake nurse had better be careful calling the youth ‘Tide Pod . They are fired up and will soon be the voters that vote this fade nurse out of office. Beverlie Boswell for Dog House! Trump has taught Boswell well. Claiming issues are non issues and sending up smokescreens to cloud mistruths and errors. She calls high school kids names and she whines and cries about people blasting her? The kids have more maturity than this wannabe and others who think like her.